I was sitting in my garage recently looking at my collection of tools on the pegboard, and was thinking how much I take them for granted a lot. When working on projects, I don’t think twice about the tools. They are just sitting there waiting for use. I grab one as the task requires, and it gets the job done. So an ode to my under-appreciated tools, I put together a list of the most used tools in my garage. If you’re a budding DIY’er just getting your feet wet in the home improvement field, you should aim to acquire these tools as the need for them arises. You could get them all at once, but that’s a pretty large investment, and a lot of the tools would probably just sit abandoned longing for usage. Remember, as your skills improve, and projects under your belt accrue, so will your tool collection grow. Also, I didn’t include obvious ones like a hammer, screwdrivers or socket spanners. 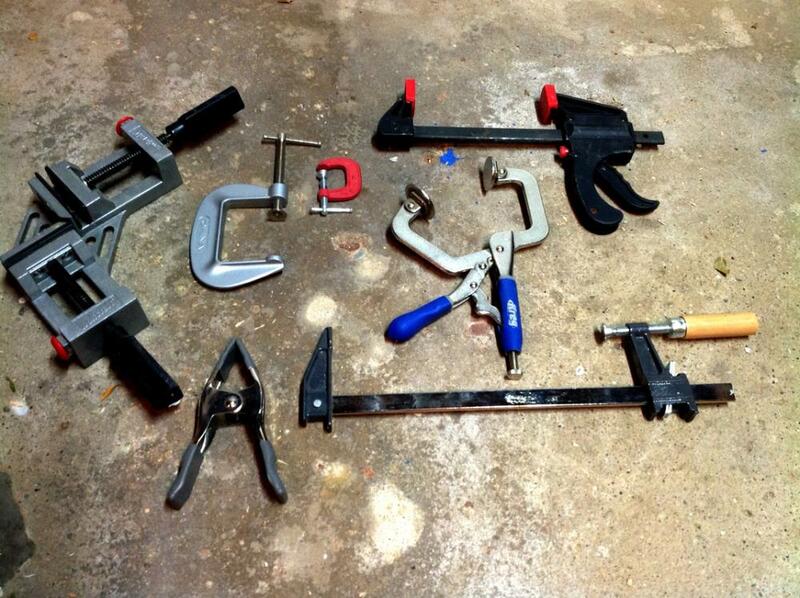 So without further ado, here are 12 must-have tools for DIYers. 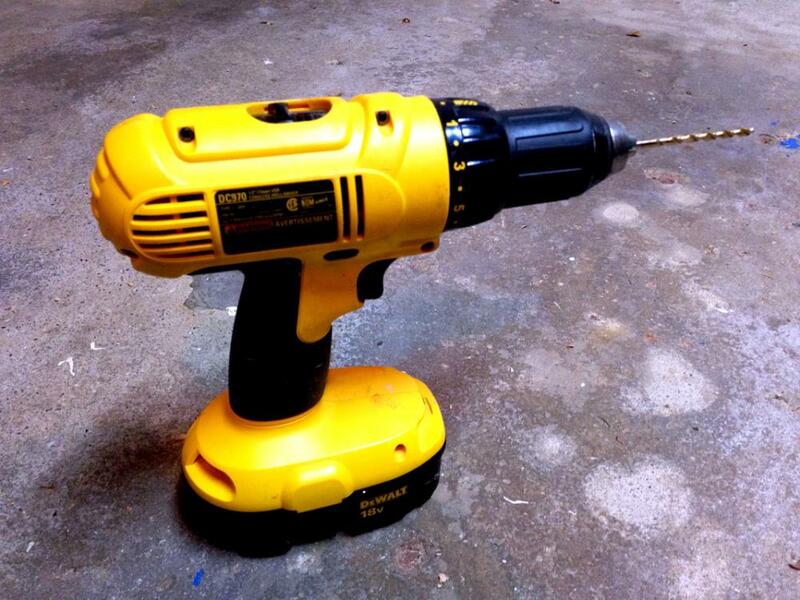 My drill is the most used tool in the garage. It’s such a versatile tool. It’s functionality goes far beyond just making holes with drill bits. I use screwdriver bits to work with screws. I use a socket adapter to work with hex bolts. When dealing with odd angles, I can use a right angle adapter to perform 90 degree drilling. With a paddle adapter, I can mix paint or grout. Just recently, I discovered I can pump liquids with a drill pump adapter. With so many different types of drill adapters out there, my personal collection is barely scratching the market, so I’m always on the lookout for cool ones. My reliance on drill bit adapters encouraged me to even purchase a second drill. It takes time to swap out drill bits or adapters, and it was starting to become an inconvenience when working with multiple ones at a time. So tasks like drilling pilot holes for screws, and actually screwing in the screws was simplified to just a task of picking up the first drill, then picking up the second drill. I even got extra batteries so that I could replace a dead one immediately. These time-saving expenses improved my project efficiency tenfold. So it’s a no-brainer why the handy drill is first on my list. Some of the projects I used the cordless drill on are constructing the sliding garage shelves, creating a boxing speed bag station, and installing tile backsplash. I originally purchased my miter saw for cutting the angles needed for a crown molding project I did a few years ago. It turned out that this was just the tip of the iceberg of functionality that the miter saw could do for me. Prior to the jawhorse, cutting wood meant breaking out the hand saw. I would rest the wood on whatever was nearby, and either stand on the wood or hold it firmly with the other hand. If I had the Jawhorse setup, I would just clamp it down and make the cut. Now I’m always up for a good workout, but making cuts by hand takes time. The cuts are also notorious for being inaccurate because it’s hard to cut perfectly vertical by hand. The miter saw changed all that. I just put the wood in position, pull the trigger, press down the saw, and a perfect cut is made every time. 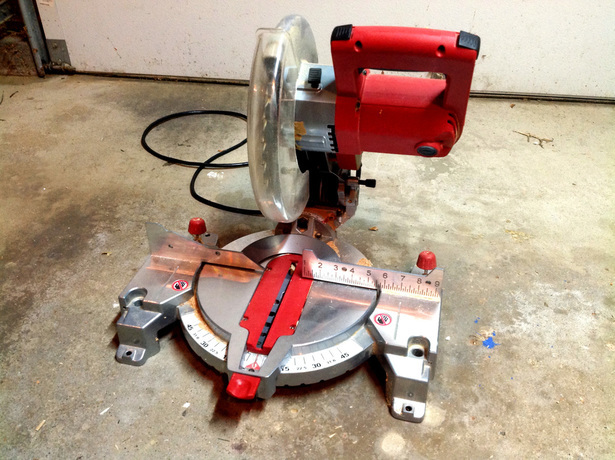 The miter saw also allowed me to do something I couldn’t do before – quickly prototype ideas. A few of the projects I used the miter saw on are building the outdoor storage shed, the wagon for mower, and the water-saving rain barrel. For many years I got by without wood clamps. I did not know what I was missing out on. Then one day I had to borrow a bar clamp from my neighbor to hold down some warped wood while I nailed it in place. I was hooked. I could not have done that task without a clamp, and many projects since then have been aided dramatically with the use of wood clamps. Clamps come in all types and sizes, from small C clamps to really long bar clamps, and everything in between. I now have a variety of these clamps, including some specialty ones too – 90 degree clamps (when you need to hold two pieces of wood perpendicular to each other, like when building bookshelves) and face clamps (for holding two pieces of wood flush with each other for joining, like when using pocket holes). Some of the projects I used wood clamps on are building my folding workbench, creating French cleat box shelves, and making an outdoor picnic table. The table saw has really brought by workmanship up a notch. I bought mine out of necessity when I hit a snag building my storage shed. I needed to make some long precise cuts that were too difficult to accomplish using my circular saw or by hand saw. Being one of the more costly tools I own, I had delayed in getting a table saw for the longest time. Now that I have one, I have never regretted the investment. I use it for everything from cutting T-11 siding to turning scrap plywood pieces into French cleat shelves. It’s such a versatile and precise tool, even the neighbors (and the neighbors grown children) are coming to me for help! As for accessories, I purchased an awesome featherboard to help guide my cuts (a lot of people usually build their own, but I needed one right away for a project and didn’t have the time to make one – plus the purchased one is much more flexible than one I could have built). I also plan on getting some dado blades in the near future to quickly notch wood and cut grooves. I used the table saw on many of projects including, the ​outdoor storage shed, the custom mailbox post, and the wagon for mower. 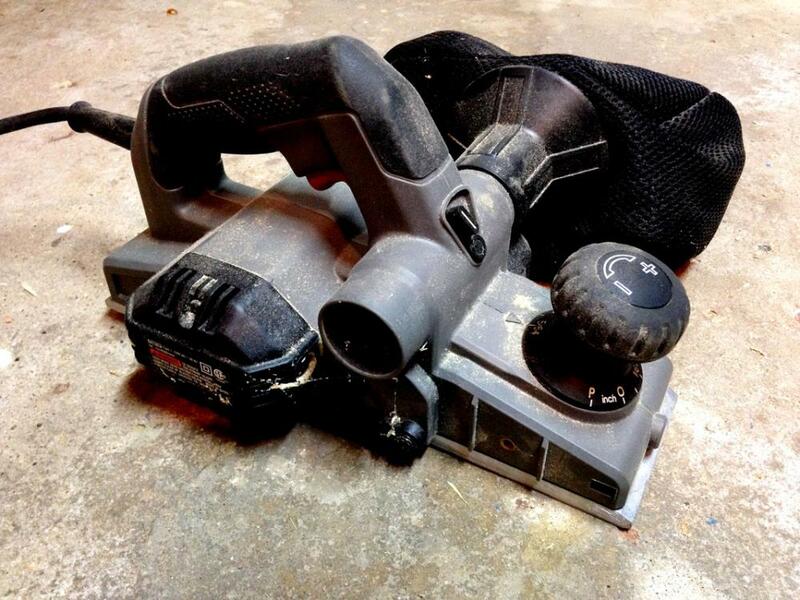 When you work with wood, you’ll come to appreciate a good sander. There are lots of different types of sanders out there. 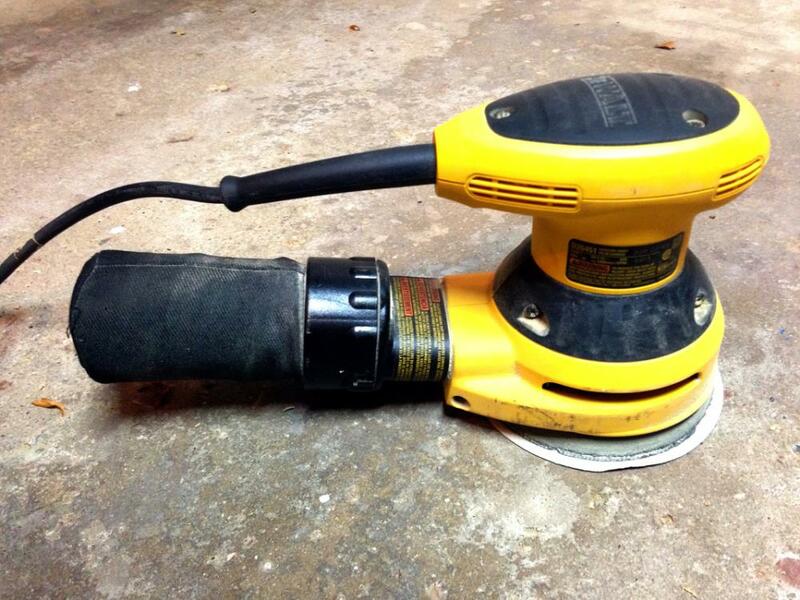 Yet, for a DIYer, you can’t beat a random orbital sander. I purchased mine several years ago to help Eileen refinish an old wooden coffee table. Prior to that, I had a little mouse sander, and that definitely wasn’t up to the task of stripping the whole table down to bare wood. I was amazed at what a good job the orbital sander did. In no time at all, the wood was exposed. I did have to use the mouse sander to get into the small, hard to reach areas, but that’s the purpose of a mouse sander. 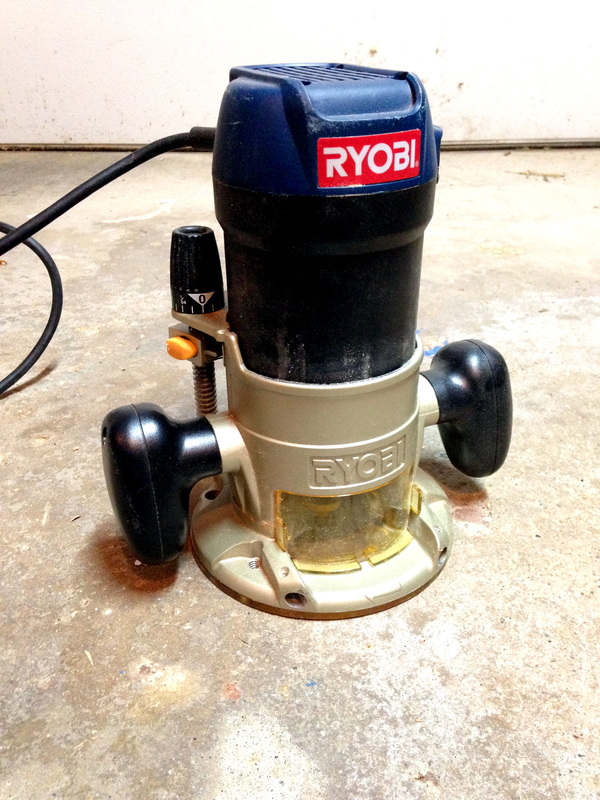 These days I use the orbital sander for almost every sanding task at hand. I just pick out the appropriate grit sandpaper for the job, fire up the orbital sander, and smooth wood is just moments away. Some of the projects I used the random orbital sander on are the folding workbench, wagon for mower and outdoor storage shed. I purchased a plunge router a long time ago to help with cutting dado grooves for building a bookcase. It did an excellent job. Then it sat dormant for a long time until I started experimenting with bits other than straight cut bits. Now I find myself using the plunge router so much at the end of projects. It really turns a good looking project into a WOW project. Specifically, I’m using round-over bits to make nice beveled edges for my woodworking projects. I built a picnic table the other day and didn’t want people getting splinters from the edges. So, I used the round-over bit to make a nice smooth profile. Most recently, I made a very professional edge for my folding workbench with another version of the bit. I’m excited to try out different types of routing bits in the near future and hone my routing skills. 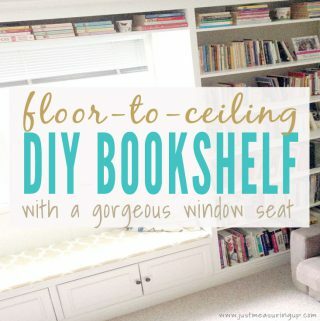 I used the plunge router when I built a wall mounted bookcase and when I created my folding workbench. This is another recent addition to my tool collection. I was working on a project the other day and needed to make sure really awkward cuts in a small space. Realizing I didn’t have the tools to accomplish this easily, an opportunity arose to purchase an oscillating multi-tool. I’ll admit that I didn’t know much about these tools at the time, but I was fairly sure it could accomplish the task at hand. After some research, I bought a cordless version and it did exactly what I had expected it to do. I didn’t think I would be using it much more after that, but I was wrong. I find myself grabbing this oscillating tool off the wall so many times to do cuts or to perform some sanding when I don’t feel the need to set up a larger tool. It is sort of a hybrid between my compact circular saw and my electric sander. A few projects I used the oscillating multi-tool on are the folding workbench, the sliding spice rack and an outdoor picnic table. You would think that a shop vac was one of the first tools I got. 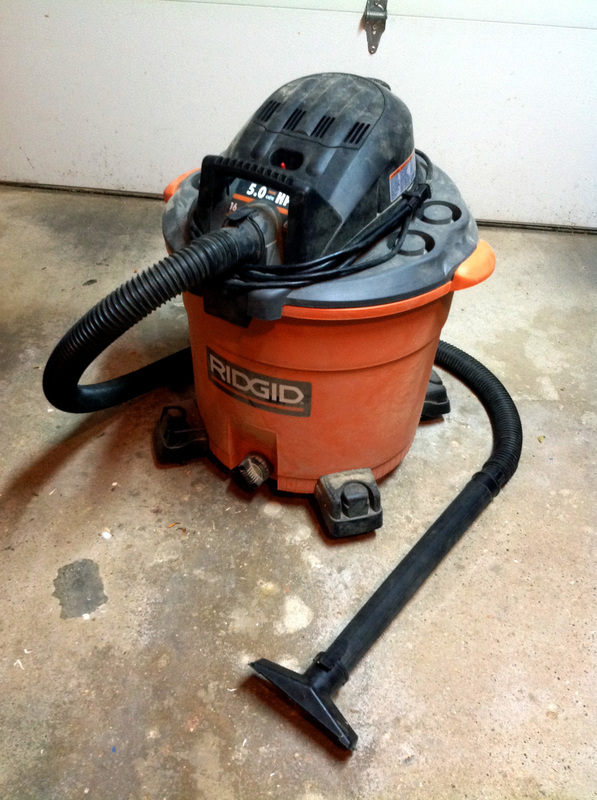 In actuality, I just purchased my first shop vac about a year ago. I can’t believe it took this long to appreciate the cleaning power of a good shop vac. I had gotten used to saw dust being everywhere, and the floor of my garage looking like a mess. With the shop vac, now everything is dust-free and my garage floor is always spotless. After every wood cutting session, I start up the shop vac. In no time at all is the sawdust gone. What I love most about the shop vac is that it picks up anything, including nails and screws. I didn’t know this before (any probably why I only just recently got a shop vac). Now I don’t have to worry about parking the car in the garage and driving over sharp debris left over from past projects. The shop vac makes certain that everything is removed from the floor. 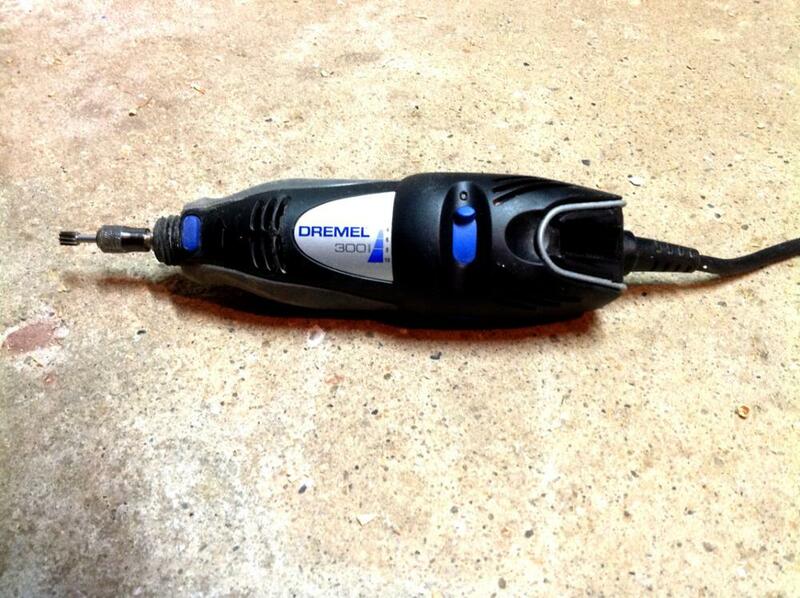 Every garage workshop owner should have a dremel and a host of accessory bits. Not only is it great at precise woodworking cuts, but makes metalworking a feasible task for me. I was a little nervous at first working with metal, and the sparks flying off the fiberglass reinforced cut-off wheels wasn’t helping, but it got the job done to a perfection. In no time was a great looking square hole in this thick metal sheet, and my computer could now happily exhaust its heat. Since then, I’ve never looked at metal as a barrier for me. In fact, I recently bought some overhead garage shelving, and unfortunately, some of the assembly holes didn’t line up, so some bolts couldn’t fit all the way through. Without the dremel, I may have had to return it. However, I used a tungsten carbide cutter bit and expanded the hole just enough to make it work. The dremel also works great for sharpening my mower blades too. A couple of projects I used the dremel on when I was fixing up the mower and when I built my folding workbench. This is a staple tool of most garages. I love waking up in the morning to neighbors whirring their circular saws as they are hard at work making sawdust. 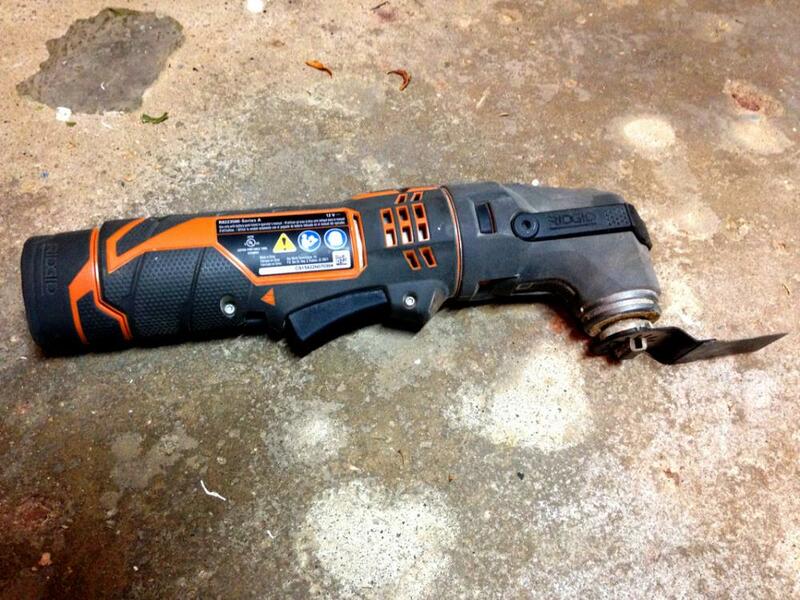 It’s one of the first power tools I purchased and has seen many hours in the field. I use it for everything from ripping plywood sheets to cutting out lap joint grooves. Most recently though, I acquired a compact circular saw and it’s a dream to use. The downside of a regular circular saw is that it is heavy and bulky, and so hard to use in tight spaces or above your shoulders. They are also very tricky to do small precise cuts. The compact version solves all of this. It makes small cuts a breeze to handle, and can fit almost anywhere to perform the cuts. I originally purchased the compact circular saw to cut out window holes for my shed. I tried using a regular circular saw, but quickly gave up because it felt really dangerous holding the behemoth over my head. Now I use the compact one almost anytime I need to cut wood. ​I love the convenience and precision it gives me. It does have a very limited cutting depth though (little over an inch), and is not as powerful as a regular circular saw. So I still rely on the regular one for certain jobs. 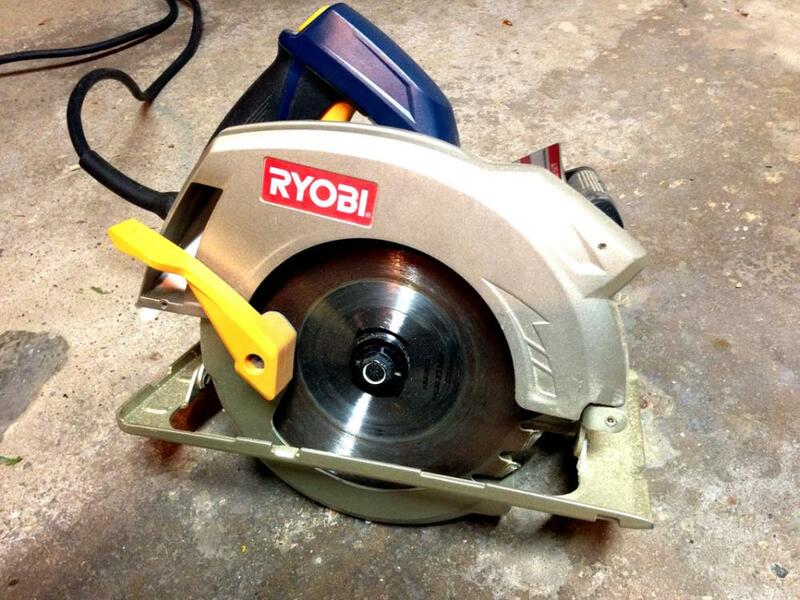 I used the circular saw on many of my projects, including the outdoor storage shed and a custom mailbox post. These were introduced to me a few years back, and what an amazing tool they are. I didn’t know they existed, as I had a regular hand planer, but it didn’t get much use. I was never really good at the technique and could not seem to get the blade sharp enough to be useful. Then my neighbor lent me his power planer one day to help me shave down the tops of my closet doors so they would close properly. In a few quick swipes, I trimmed a small layer off the tops of my doors. After that, they no longer jammed. For years these doors never closed properly, and now they were fixed in minutes. ​So I ended up buying my own power planer later on. Not only do all the doors in my home close properly now, but I’ve used it in so many projects where I needed to level wood that wasn’t lining up right. My finishing nail gun was the most recent tool I acquired for my collection. It was up there price wise along with the table saw, so it was an investment. However, it’s the crowning jewel of my collection. 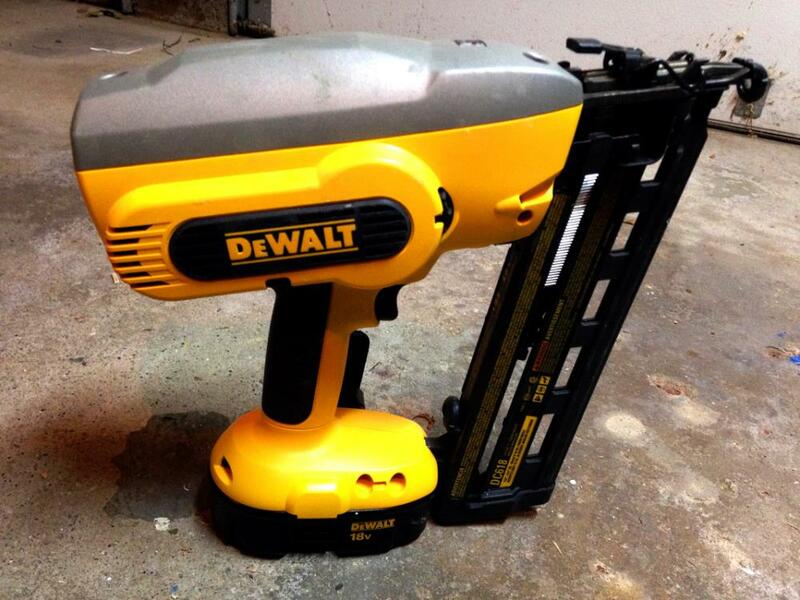 You know you’re an accomplished DIYer the day you buy your first finishing nail gun. I don’t use it as much as the drill, per say, but when I do use it, it’s such a convenient and efficient tool. It makes you want to keep going and going and get your project done. I did a lot of research prior to purchasing the nail gun, and eventually settled on a 16-gauge version. This thickness nail would be applicable to a much larger range of projects than other gauge nail guns could do. 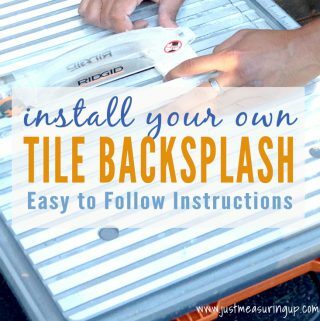 I originally purchased it to help install some crown molding. Since then, I have used it for help in so many projects. In just one weeknight, I built a variety of box shelves for the garage using the nail gun (with the help of construction adhesive and scrap plywood). It would have taken me much longer using regular finishing nails and a hammer. ​Just the other day too, I was erecting a 6×6 wooden post in concrete. I used the nail gun to temporarily attach some wooden supports to keep the post level. I look forward to any opportunity I get to use to my finishing nail gun. Also, I used the finishing nail gun on a couple of projects lately, including the French cleat box shelves and a shade sail. I have plenty other tools (like my framing nail gun and jigsaw). 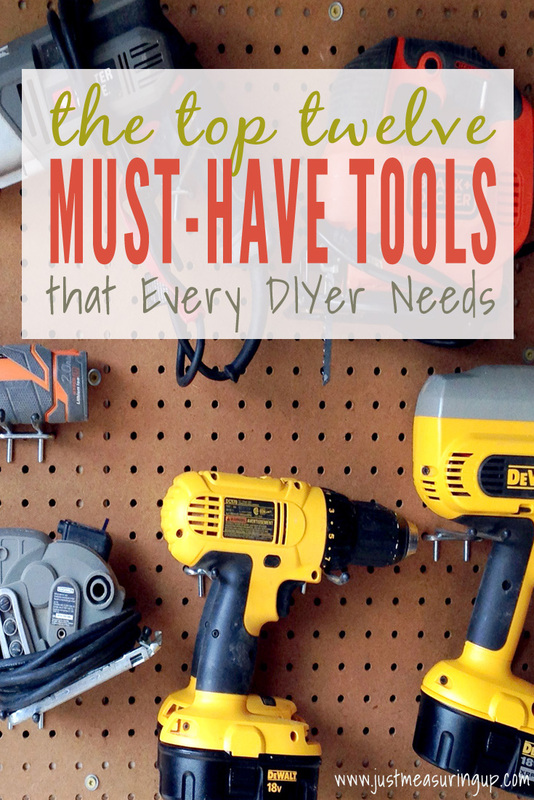 However, this list of tools shines a light on what your average DIYer should aim to eventually have in their garage – the must-have tools for DIYers. However, I do have a wishlist of tools that I would love to add to my collection. Things like a reciprocating saw, drill press, and sliding compound saw. ​I’ll get those eventually as the need arises for them, and maybe they will have an impact on my list of most used tools. On a final note about purchasing tools, there is nothing wrong with getting them used. A little cosmetic damage is not a big deal, just make sure the tool still functions properly. Also, sometimes you’ll have to do a little bit of cleaning to restore used tools to optimal functionality. A year ago, I had purchased a used Paslode framing nail gun on eBay for around $100. It retails new for more than double that. The nails started to jam after a few days of usage. So, I bought a cheap cleaning kit. I took apart the tool and cleaned it internally with a special spray from the kit. It now fires nails like a brand new gun. 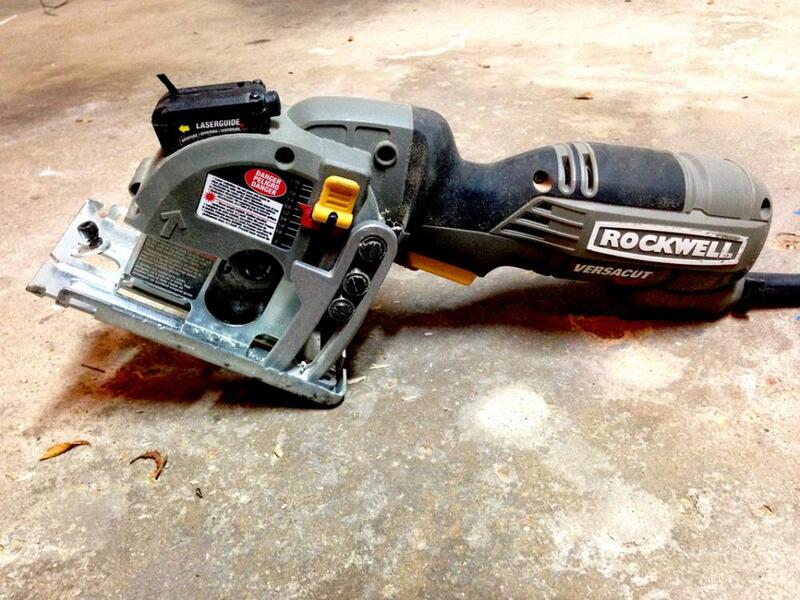 ​Anyway, all this tool talk has certainly gotten me in the mood to make some sawdust, so off I go into the garage. Excellent list for DIY. Thank you for sharing your advise with us at Vintage Charm. As a DIY’er, I really appreciate your work. I purchased this router for router table use because it allows the user to set bit depth from the top of the router table using the provided winder handle.